Artist/Author : Tyler, M. J. and P. Doughty. Western Australian Museum, 2009. 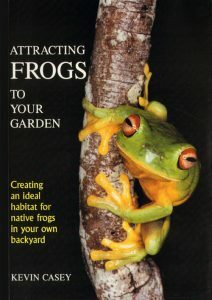 208 pages, Octavo, paperback, limp plastic, colour photographs, maps. 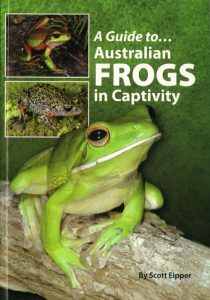 This publication describes Tasmania’s 11 species of frogs, in two families: Hylidae with three species and Myobatrachidae with eight species. 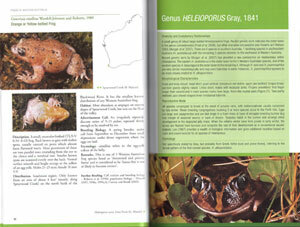 There are subspecies of Lymnodynastes present on the main island, Flinders Island and King Island. 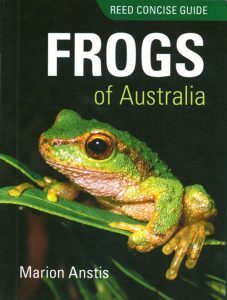 The first synthesis of the frogs of Tasmania, co-authored with Angus Martin, was published in 1974 as a chapter in the Biogeography and Ecology of Tasmania, and was followed in 1982 by the Field Guide to Tasmanian Amphibians (also with Angus Martin). 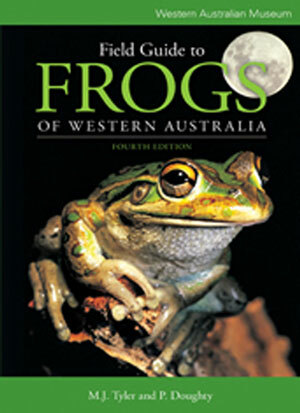 In 1988 the author and Graeme Watson surveyed frogs in the World Heritage area of Western Tasmania. 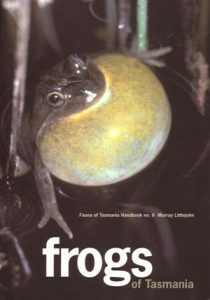 Subsequent research has included detailed studies of the geographic variation in the advertisement calls of frogs in Tasmania, on the adjacent mainland and in New Zealand.